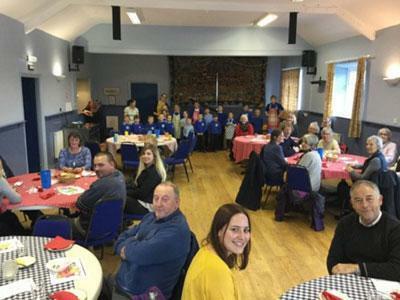 The children had a very busy and productive day as we held our annual ‘Community Harvest Lunch’ and invited parents, friends and villagers to join us for a delicious bowl of homemade vegetable soup, crusty bread roll and fruit crumble – all prepared by the children themselves! In the week up to the lunch, the children brought in an array of fruit and vegetables from home to contribute to our delicious homemade offerings – from leeks, potatoes, squash, carrots and home grown courgettes – to freshly picked plums and apples straight from our gardens. In the run up to the day of the lunch, we used the produce across the curriculum – from measuring in maths to observational ‘still life’ drawings in our art lessons. The children put on their aprons and set to work at the beginning of the morning, they were given the option of making the vegetable soup or fruit crumble. We are very grateful for the ‘hands on’ help from our parent volunteers. The School Council worked hard to set up the village hall, welcome guests, take the orders, serve the lunch and collect any donations. The chosen charities this year were ‘Save The Children’ and ‘Guide Dogs for the Blind’ – as chosen by School Council. 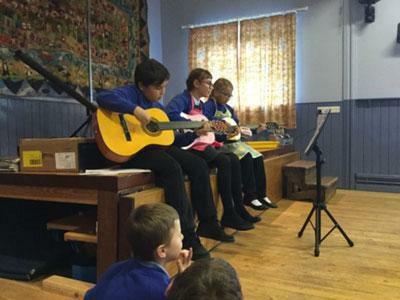 The lunch finished with the children singing two harvest hymns to our guests, as well as a special guitar performance. We would like to say a big Thank you to all those attended to make it such a special community event. A total of £75 was raised, which will be divided equally between the two charities.